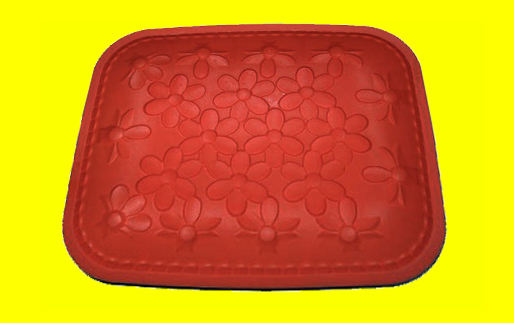 ROSE’S heavenly CAKES: She Loves Me Cake (page 15) is baked on a beautiful rectangular layer pan embossed with daisy flowers. i love the concept and immediately forayed on ebay. won the bid, then later forayed for one more, in silicone! i doubt the silicone pan will brown evenly evenly, but needless to say, it works as the perfect storage protector for the metal one! specially because i have about 3 feet worth of stacked bundt pans! Had no idea this even exists in silicone! I wonder what should I do with it. I covet the pan. So pretty! I shall check out ebay as well :). 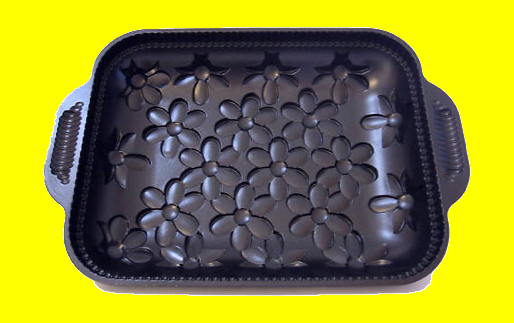 J, I found just abut every nordicware pan on ebay. do lower oven temperature if the coating is dark as recommended on the book, unless you prefer a dark crust which indeed I adore!